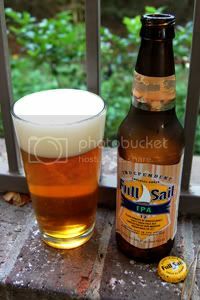 Founded in 1987 in Hood River Oregon, Full Sail was the first successful retail microbrewery in the Pacific Northwest, helping pave the way for the region to become one of the meccas of beer. Today, Full Sail is still a leader in the craft beer space, ranking as the 18th largest craft brewery in 2010. [A] well-balanced, golden-colored brew that has a crisp hop finish that doesn't bite. With its palate cleansing finish, IPA is a perfect for highly spiced dishes with curry, ginger, garlic or cumin. Sounds like a refreshing brew, let's dive in. Appearance: A crystal-clear, golden-amber body capped by two fingers of off-white head that sticks around a while and leaves good lacing. Aroma: Citrusy and earthy hops over rich, caramel malt. Very much an English style IPA. Taste: Up front it's mildly bitter, eathy, herbal, and citrusy hops. Underneath, a lightly toasted caramel malt backbone provides plenty of balance. Perhaps a little too balanced if this were an American IPA, but acceptable for the English style. The aftertaste is toasty and just a little juicy. Mouthfeel: Medium bodied with sharp carbonation. Dries in the finish. Drinkability: Full Sail have brewed up a very sessionable IPA here. Verdict: A decent English style IPA, but to be honest, generally unexciting. If you've never tried an English style IPA, this would be a good way to see what some of the differences are.